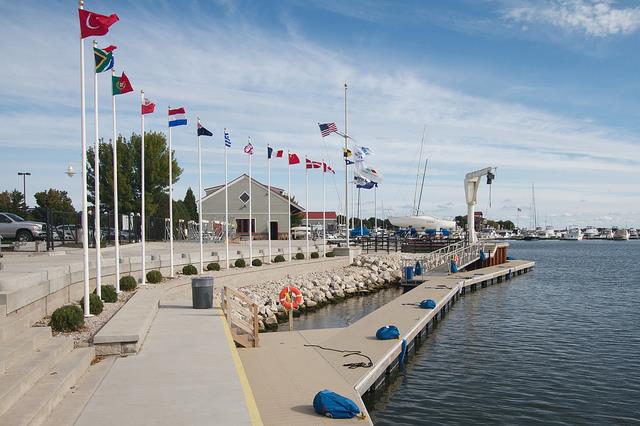 The 2020 Lightning Youth World Championship will be held at Sail Sheboygan with assistance from Fleet 187, The Midwest District and Sheboygan Yacht Club Friday, June 27 - Wednesday, July 1, 2020. The Organizing Team is looking forward to hosting 20 (possibly more) Teams. Daytime high air temperatures in July average 80 degrees with the nightly low in the 60’s. Lake Michigan’s cool water temperature and warm summer days provide reliable and predictable southerly thermal breezes that range from 5-17 knots. Daily and historical wind speed and direction and air temperatures are available through a NOAA National Data Buoy Center maintained at the Sheboygan Harbor Lighthouse. The data can be found at http://www.ndbc.noaa.gov/station_page.php?station=sgnw3. Wave height is generally determined by wind direction and velocity and is generally 1-2 feet but may range from 0 to 6 feet. Current is minimal. The two US and two Canadian skippers from the Junior division, having the best scores among those born on or after 1/1/00, and who are willing and able to represent the US and Canada, shall be named the US and Canadian entrants for the 2020 Lightning World Youth Championship Regatta. As a clarification, neither the skipper nor crew can turn 21 years old in the year they sail the 2020 World Youth Championship. Other Countries, please check with your Country VP, local District Commodore or the ILCA Class Office. Country VP's to post your qualifying regatta(s) please notify the ILCA Class Office.